"Young women of good character, attractive and intelligent, eighteen to thirty, to work in Harvey Eating Houses." Molly is now illegally employed as a Harvey Girl, a job that her sister takes great pride in. However, Molly does not enjoy the work and misses her friends and the home she had to leave upon her father's death. The majority of this story involves Molly scheming about a way to get her sister married off so that she can return to Illinois. It isn't all bad though. Molly does make some friends among the local Indian tribe. She also finds herself to be a favorite worker of the Harvey Eating House chef. She finds herself settling into the Raton community in a surprising way. It just takes a little while for Molly to come to appreciate her new surroundings and opportunities. On the whole I found this to be an interesting story. I'd never read anything about this particular subject matter before and it was fun to read about life out west along the railroads. I have to confess a bit of suspicion as to my ability to really enjoy the story right from the get-go though as it opens up with Molly and her boyfriend being caught about to kiss. I had my typical eye-rolling response for thirteen year olds who are "in love. "I was wondering how much teenage romance I was going to in for but thankfully it did lighten up quite a bit. The romance shifts from the thirteen year old to the Harvey Girls which I think is much more reasonable. There is some squabbling over handsome customers which I really wish would be left out of Middle Grade Fiction (but I thought was done in a much more realistic manner.) I find myself more drawn to Middle Grade fiction rather than YA precisely because the adventure of the book is typically ten times more intriguing and you don't have to deal with unbelievable romances. But this really wasn't so very bad. It just exists so I feel the need to point in out. 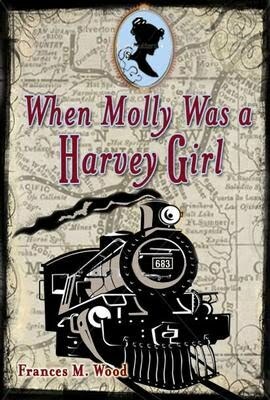 For a story about life along the railroad back in the olden days, then When Molly Was a Harvey Girl is definitely is an intriguing book. It's a fun piece of historical fiction for younger readers. If you are reading from a more conservative perspective though, just be aware of the romance factor at the beginning of the book. It does sort itself out though so I'm glad I pressed on and read it! Thanks, Kane Miller, for allowing me a chance to read this book! I had never heard of Harvey girls until Tracie Peterson had one of her main characters a Harvey Girl in one of her books. Unfortunately I can't remember which one. I agree about the romance in YA books -- it would be nice to get young people's minds onto something else! I've never heard of Harvey Girls either, so this makes me curious. I have the same reaction to teen romances... Glad this one sorted itself out. I've never heard of a Harvey Girl, either. Hmmm. . interesting! This is the second reference to Harvey Girls I've seen recently... (perhaps the first was yours too? :) and now I'm curious! I really like to read about little facets of history that haven't already been done to death. Might have to check this one out!